What can we say? Zombies are hot. We highlighted the new Zombie Shooters Association in an earlier post. There have been Zombie targets available for several months now but this is the first gun cleaning system I’ve seen. I will check this out in person at SHOT Show next week. Until then – keep reading for information about the latest offering from Otis…. From the Otis press release: Things have gone green at Otis Technology with the launch of their new Zombie Gun Cleaning System just in time for the 2012 SHOT Show. If thoughts of Zombies keep you up at night, Otis Technology, the leading manufacturer of gun cleaning systems and accessories, has an apocalyptic survival item to add to your Zombie collection. Serious Zombie hunters and enthusiasts absolutely must keep their Zombie firearms clean and properly maintained to be ready for the next attack. The new Zombie Cleaning System from Otis is designed to clean all 5.56MM rifles, 9MM and 45 caliber pistols, and 12 gauge shotguns. It includes 8” and 30” Memory Flex® Cables for effective and correct Breech-to-Muzzle® cleaning, four (4) bronze bore brushes, a rubberized patch saver® for a 360° cleaning of shotgun barrels, and specialized precision tools for a complete breakdown and fine cleaning of all critical and hard to reach areas of your firearm. A green bore reflector/flag safety, D.O.A./85 Solvent, and a limited edition Zombie labeled soft case are a few of the unique components featured in this new system. It’s a no-brainer. Don’t make a mindless mistake when you’re trying to save your life from the walking dead. 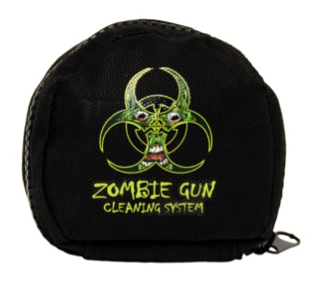 Get back in the game and clean your Zombie firearm with Otis! 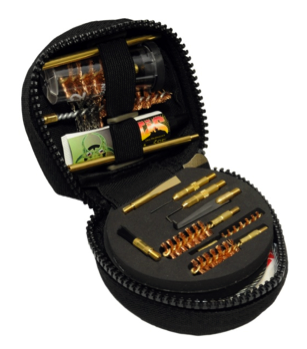 Otis Technology is known for manufacturing the most advanced gun cleaning systems available. The superior Breech-to-Muzzle® design combined with unmatched quality has positioned Otis as the gun care system of choice with the US Military. Otis Technology is SMART GUN CARE. This entry was posted in Press Releases, Product Reviews and tagged gun cleaning kits, how to clean a gun, otis gun cleaning kits, otis technologies, zombie shooters, zombie shooters association, zombie shooting matches. Bookmark the permalink. I want that logo as my next tat!!! Otis was giving out temporary tats with that logo at SHOT Show! T-shirts, too! Seriously though it’s a great kit for 3 gun.